This large format paperback is unfortunately out of print, but it is relatively easy to find on the second-hand market and should be an automatic purchase for anyone who is thinking about starting to build rods out of split bamboo. The author makes no claims to be a master rod builder, but he writes with an easy style that gives a very good idea of the commitment and skill set needed to build hexagonal cane and the book is illustrated throughout. The title says it all, really - this is the story of how a particular rod was made and Nick tells it warts and all, from choosing a culm right down to going fishing with the finished product and although the book is only a hundred pages long, it tells the story about as well as one could wish, without going into too much detail. 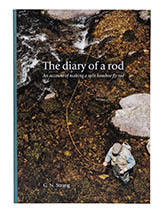 If you aren't thinking of building your own bamboo rod, but you own one, or are thinking of buying one, you really should consider picking up a copy of The Diary of a Rod too. Why? Well it isn't Garrison and Carmichael, for a start. What you get here is just enough of the flavour of what it takes to build in bamboo without it turning into a manual, which is what A Master's Guide is, no more and no less. By comparison, Nick Strang's book is a taster and it is pitched just right.